Head lice can live up to 30 days before dying they live hundreds of eggs behind. It is estimated that one louse can lay 7-10 eggs per day. That is an estimate of 300 eggs in it's lifetime. Is anybody else thinking, yuck? Coconut oil can kill head lice. Apply a generous amount to the hair and saturate. Leave the oil on overnight and most of the live bugs will be dead. Repeat as needed and use a lice comb to remove the nits. Pets do not contract head lice. Head lice is a human parasite that spreads from person to person. So don't worry about the cat or the dogs and focus on the family. Head Lice Frequently Asked Questions click here for more information. 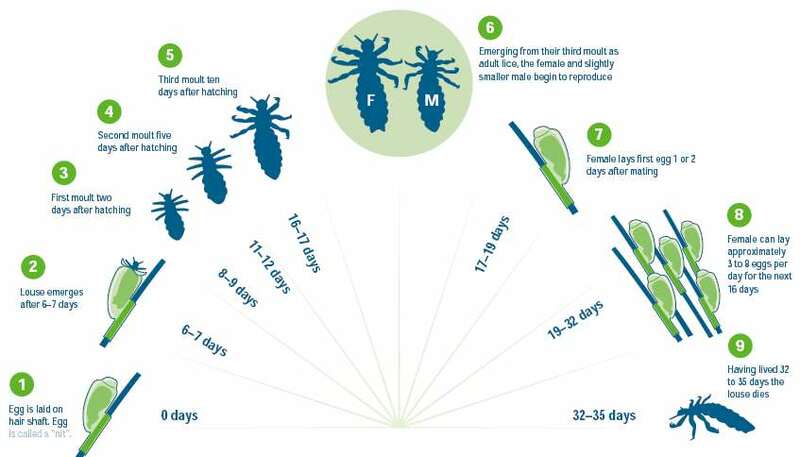 Head Lice are spread from person to person. It does not come from dirt or trees. It spreads through head to head contact such as sharing brushes, hugs and selfies. Head lice have been around thousands of years and have been found on the bodies of mummies. They will continue to be around for our lifetime. Super Lice have been discovered in 48 states within the United States as of August, 2016. You have probably heard about super lice in the news and how they are becoming a big problem in the last few years since they are difficult to get rid of. What Are Super Lice? Super lice are a resistant strain of head lice.